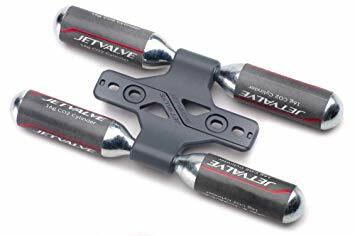 JetValve Co2 mount allows you to carry 4 Co2 cartridges attached to your bike. This is a great product for conveyance as you could always have gas for your tyres and never be left with a bike that has a flat tyre to push along. It's only compatible with 16g and 25g threaded cartridges. Holds 4 co2 cartridges (not included). Can fix to bottle cage. Cartridge and inflator head not included.